Having experience in jewellery making since 1960, the owner of the Jewellery and Clock Shop, Leonidas Michalopoulos, began his first sale business in Zakynthos in 1983. Since then, his occupation with gold, jewelry and watches has become a relationship of life and passion. 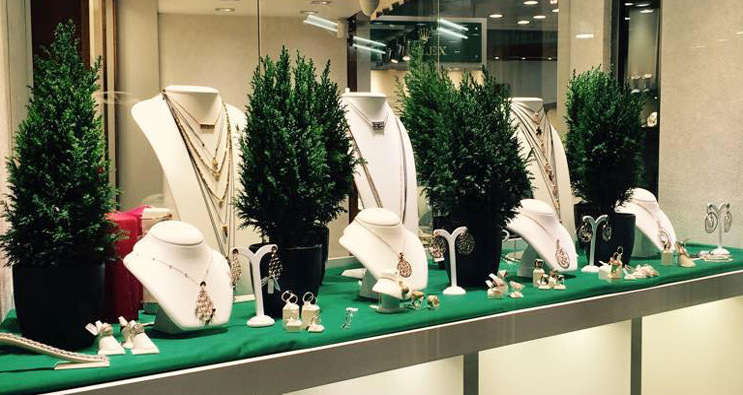 Over the years, Mihalopoulos shops have been established in the consumers’ consciousness as equivalent to quality, thanks to their excellent jewellery and watches. There are two shops in the town of Zakynthos. 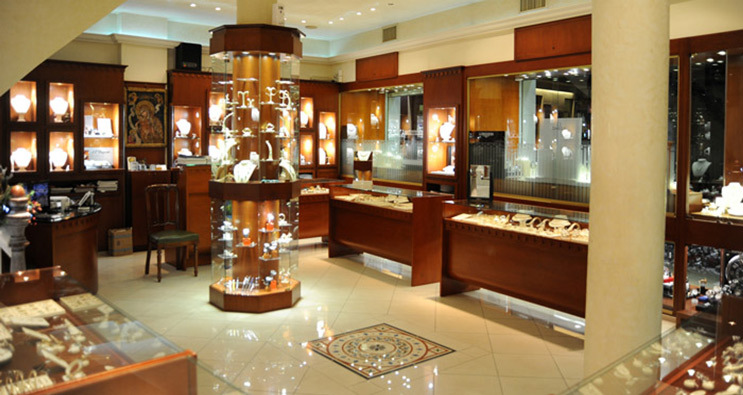 Kyvetos Jewelery and Watches Shop has been operating in the town of Zakynthos since 1939. Experience in Gold and Watches is a guarantee for every visitor-customer of the shop and there has been a trust relationship for decades. With a wide variety of gold creations and well-known watch brands, Kyvetos store satisfies even the most demanding customer. There is also a great variety of quality gifts. It is located in Alex. Roma street, the main pedestrian street of Zakynthos town. Zakynthos, renowned as the “Flower of the East” due to its rich flora, delightful gardens and golden Mediterranean beaches, also enjoys a strong tradition of perfume making, the roots of which spread deep into the past revealing unique fragrances and secret beauty recipes. On the wonderful hill of Strani, where the Greek poet Dionysios Solomos wrote the Anthem to Freedom, Razi perfumery (Razi Aroma Mediterraneo) has been operating since 1963. "Zakynthos smells like the Mediterranean, like blossomed gardens and golden sandy beaches" Razis family claims in order to advertise their perfumes. At Strani Hill, the visitor will be able to see how the lovely perfumes have been made for decades while in Alex. Roma street in Zakynthos town, there is a Razi shop. "You have to have a will - for new ideas and to do things in order to make your vision come true" were the words of Dame Anita Roddick, a female activist who conceived and implemented the idea of ‘The Body Shop’. The first ‘Body Shop’ opened on March 26, 1976 in Brighton, on the southern coast of England. 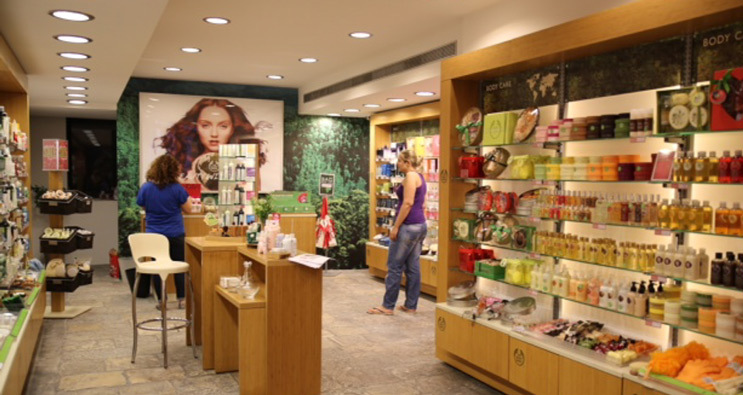 Since then, The Body Shop stores have opened in almost every country in the world and the company sponsors programs for the protection of human rights, animal welfare and the environment. Its products are excellent, with pure natural ingredients, not tested on animals. They are the favorite products of women and men of all ages who take care of themselves and respect the environment. 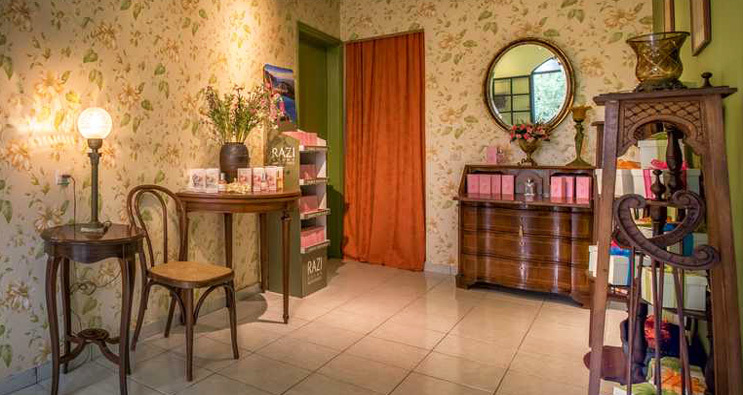 In Zakynthos, The Body Shop is located in Alex. Roma street, the pedestrian street of the town.